Every day your team has one time slot dedicated just for tactics training. This unit can be used to train either one of the six field tactics, the offside trap, or standard situations. You can also use one trading card per day in your training to get extra tactics training. It is always a good idea to train standards. The better they are trained, the better the chance that a standard situation (like a free kick,) results in a goal. Standards should be trained early on. The offside trap is a highly effective way to stop some of the opponents’ attacks from the start. However, if the offside trap is not trained well enough, the trap will fail often and in those cases the attacks lead to goals very often. The offside trap should be trained to at least 80% before it is used. There are six different field tactics your team can practice. Each of those tactics will give a bonus to some part of the team, at the cost of weakening the rest. The benefits go up when the tactic is trained, the penalties are always the same. Because of this it is not advised to use badly trained tactics. A tactic should be trained to about 80% before it is used. Every tactic has it's uses. Before you decide which one you want to train, take at look at your team and your formation to see which suits your team best. Select the training statistics tab on the left to see the current status. The white vertical line shows you the point at which a tactic is beneficial. When you play 'Pressing' you assign your offensive players to engage themselves in defensive work and to already attack your opponent in his own half. With this tactic your midfield will be enforced by the offensive players and you probably will have more ball possession. The negative effect is that your offensive and defensive quadrants will have less strength. In numbers: At 100% trained, the midfield Sectors (4-6) receive a bonus of 20% — the other six sectors are affected by a 7.5% malus. With the counterattacks you will try to get through your midfield as fast as possible. After winning ball possession the ball is brought to the offense as fast as lightning. The defense and the offense will be stronger but the midfield will be weaker. In numbers: Defense sectors (1-3) and offense sectors (7-9) will be 10% better but the other three quadrants will be 15% weaker. With Powerplay your players try to put very high pressure on your opponent and force him to remain in his own half. Powerplay is a strongly offensive tactic and enforces the offense and midfield for the cost of a weaker defense. 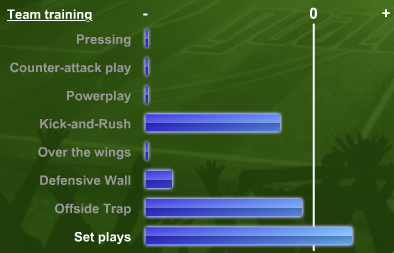 In numbers: The six offensive sectors (4-9) are enforced by 10% — the remaining three get a malus of 15%. Kick-and-Rush is quite primitive as nobody will think about playmaking much. Nevertheless, it can be very effective. As soon as your team has the ball it's only 'Forward! Run!' and they will try to bring the ball into the offense. There will be no wingplay but in the center of the field there will be advantages. In number: The central sectors (2, 5 and 8) will be 20% stronger — the other six quadrants 7.5% weaker. It's the opposite of Kick-and-Rush. With this tactic you try to use the complete width of the playfield and get to the offense over your wings. For cost of the remaining quadrants the wingplay will be enforced. In numbers: The four offensive wing sectors (4, 6, 7 and 9) will be 15% stronger — the other five get a 9% malus. The defensive wall is the most defensive selectable tactic. Every player will stay near their base line and try to make life for the opposite offense as hard as possible. The defense will be much stronger and the rest will be weaker. Careful: It is not enough to train a tactic once, your team needs to keep the tactic trained. Every tactic goes down 1% per day. To keep it up you need to either train a training unit once in a while, or you need to use it in matches. Always keep the tactics in sight.